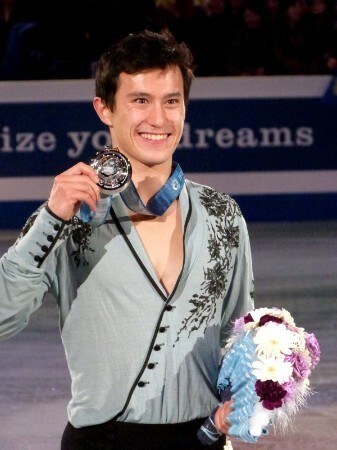 Patrick Chan set new record scores at the Trophee Bompard in short and free program. Q: You had two great performances. When was the last time you had two such strong programs? Patrick: The closest was probably Worlds in Moscow. But I stepped out of the Axel in the long, but other than that it was clean, both programs were clean. Q: What does it mean to you to have skated to well and how much confidence will it give to you? Patrick: I think it gives me a lot of confidence. When I skated at Skate Canada, after the long and the short, I felt pretty comfortable, pretty confident, even though it wasn’t perfect. At least I didn’t fall and I didn’t make big, big mistakes. I was already really happy to know that the thoughts I had, the mental things I wanted to think about, the dialogue that I had, because this season is really about being mentally prepared to compete and enjoy competing a bit more. And I was able to do that at Skate Canada. When I came here, I just did the same thing. It worked out really well. To have skated that well here in Paris where it’s not home, it’s tough, it’s challenging. I was very comfortable with the ice, very comfortable off the ice, very relaxed and that really helped me. It does give me a lot of confidence for the Olympics. I feel like I’m on track. I had a plan and I’m already ahead of schedule in my plan. I can now almost imagine, almost visualize Sochi, because I know the rink and I know how it looks like. Before the beginning of the season, before Skate Canada, I was very nervous, because I was like, oh don’t know… when I visualize, it feels very uncomfortable. But now, because I have a competed a couple of times, and I feel better. I can now visualize something positive, I feel like I can repeat what I did here, there, visually. Q: You posted a massive score, 295.27 points. That’s not far off 300. What do you need to do to achieve 300 points? Patrick: There is a little bit of room for improvement, if you look at the technical sheet. There is a level three spin, some GOEs could have been higher, but that’s being very picky, right? I don’t know. That’s not my job. I’m not going and try to stretch my fingers more and point my toe more just to get more points. That doesn’t work that way. I’m just going to stick to the plan and stick to the program. You know what, this is the first time in a long time that I’ve done a clean long program. If I can start doing it more consistently, then I think the judges will start being more comfortable with awarding me more points, as they see it more and more. The first clean program is sometimes still a little shaky, like maybe a little bit slow in some areas. But as I get more comfortable and confident, I can start pushing more in some areas to get more speed and that could affect the marks, too. Q: How cool would that be? Patrick: Imagine, hit 300 at the Olympics, right? That would be perfect. It’s not really my goal to hit 300, but it would be more of a bonus. If I hit 300, it’s almost a perfect score. It would be almost tying the 6.0 system. I think it would be good for the audience and for people who watch figure skating to understand a bit better, like 100 in the short program is a perfect score and 200 in the long program is a perfect score. That would maybe help the sport and help people understand a little more or grasp the idea. Q: Why did you decide to keep you short program from last year and why did you decide to use again a music you’ve had before for you free skating. Isn’t that playing it safe a little? Patrick: The short program, I just reused it, because first of all I don’t love doing two new programs every year. It takes a lot of energy and takes a lot of time away from training, and that was the priority for me this summer – to be able to get to Detroit early, don’t do shows, don’t do any sponsor events, just get there so I can repeat the program over and over. If I can cut it down for one program, that’s great, that’s one program less to work on and stress over. I always can fall back on the short program and know that I’ve had successful skates with the short program. So it’s easier to repeat it like that. And now I’ve been finally able to do it with the long, it will be easier as I go on. The long program, I chose Vivaldi, not because, I wouldn’t say, to play it safe. You could say that last year, La Boheme was a bit of an experimental program. Everyone has that, between the Olympics, you always try to expand, try different music. You start learning what music you like and don’t like, and Vivaldi was a piece that I wanted to go back to that I knew from the minute I stopped skating it 2008 that I wanted to do again. Not in Vancouver, because I knew this was too short of a time, but for the Olympics after for sure, I knew like five years ago. When that happens, you just trust your instinct you just go with it. I kind of knew, of course that I would improve and I would start skating and moving and a lot better as I get older. So I was very curious to see how the program looks differently later on. Q: I also heard that the long program is a kind of tribute to Mr. Colson, your long-time coach. Patrick: I think I said it earlier in the season it’s a tribute, but it is not a tribute. Meagan (Duhamel) and Eric’s (Radford) short program is a tribute to their coach. For my program I wasn’t thinking about Mr. Colson the whole time. It’s not really that. David Wilson choreographed it and I worked with him. I took part in the choreography. The important part is that we both took from Mr. Colson in our lives. When David was younger, in his teen years, he took from Mr. Colson. I took from Mr. Colson when I was young, too. We would share a lot of stories together, when we were choreographing we talked about memories, bad and good memories with him. One day he (Wilson) just asked me, what’s something that he (Colson) made you do and you remember doing, like a choreographic step. Something that you hated, but now you feel more comfortable doing it. And there were some steps and I would do it and he said, oh, perfect and we would integrate it into the program. It’s just acknowledging his role in my career. This is a big season, an important season. Why not go back to you roots and go back what worked and what made me successful. Q: You’ve been through an Olympic season before, but back then you were still kind of the new kid on the block. Now you are a three-time World Champion. How different is it this time around for you? Patrick: Very different. Three World Championships gives you a lot of experience, especially when you win three. Defending a World title two times is hard. That is where you gained the most experience. This is not like trying to be cocky, I’m just saying - I don’t know how it feels to be not on the top. I’m so used to being almost a perfectionist and always criticizing and getting used to not being happy with the results I’ve gotten. It’s not like after I won the first, the second and the third (World title) I’m thinking, now I can be Olympic Champion, it’s just going to happen. No. Each World Championship was a real hard challenge and it wasn’t easy. Like last year wasn’t an easy World Championship to win. Every summer I would go back, especially last summer was the most productive. Kathy (Johnson, coach) and I talked about what I do need to do to absolutely to make the programs more consistent. It wasn’t training, first changing rinks, changing to Detroit, being in a better environment that helped automatically, and then really talking out loud about how I felt before competitions. I would have a lot of negative thoughts, like, oh my God, what if I miss the first quad, how I’m going to do the second and if I miss second quad, oh my God, imagine, how horrible that would be. There were just perpetual negative thoughts, a self-fulfilling prophecy, exactly. I train for that I can create something like a positive self-fulfilling prophecy, so I can constantly tell myself to remember all the days I’ve trained the programs over and over. When I did the long in Paris, I took my first position and I was like, picture yourself in my rink in Detroit, doing the programs every day, same time, same minute, not exactly, but same session always, and remember what I was thinking, and that was just one thing at a time, one quad at a time. Q: Obviously, there are a lot of expectations from the fans, the federation and yourself. How do you deal with that? Patrick: Honestly, the best way to deal with it, is to be selfish. I told this to myself all the time, like I say, especially in very pressured moments, when I want to do well, and people want me to do well, I just say, okay, thank you, but I don’t care. I’m not going to ever see… if I lose, if I don’t win the Olympics or if I don’t win the first medal for Canada, at least I still have my friends and people will still love me. My parents will still love me, my friends will still be me friends. Nothing is the end of the world. Kathy always says, skating isn’t a brain surgery, like you not trying to save lives here. It’s just you’re doing it for fun. That’s why I learned to when I go into the quads now, I try to be more aggressive and not passive, and it’s always good to be more aggressive on the quad, because you need more speed and power. That helps me being more aggressive and not think careful and not to be slow and careful and hesitant. When I think about the expectation of Canada and the federation, I really don’t care, because that’s the best way. I appreciate all the support, but at the same time on the ice by myself. No one else is there. They’re sitting in the chair, like enjoying themselves and I’m the one on the ice. I have to be selfish and think like I don’t care what people think whether I win or lose. I gave it my best and I’m going to train as hard as I can and see what happens, just let the rest unfold. Q: How do you manage that everybody is constantly talking about the Olympic Games? Patrick: I was lucky to experience the Olympic build thanks to the Vancouver Olympics. Honestly there’s not going to be anything that’s going to match that amount of energy and excitement, because being Canadian, the Vancouver Olympic was massive. For me, I hear Sochi all the time, and there is a lot of expectation of course, and in order for me to prepare for that, every day when I’m on on practice, especially days that I don’t feel great, I feel tired, because it’s the end of the week or I’m having a hard time training the programs and getting motivated, I tell myself that these are the moments that really are going to make an impact when I get to the Sochi Olympics. You’re just kind of building the layers and kind of resistance to situations that could be distracting or that could affect the way I skate and so on. Every day when I train and especially tough days, I just a little hint of, okay this is in preparation for the Games of course. Q: How do you feel on Evgeni Plushenko’s comeback? Patrick: It will be great if Evgeni can be there. It’s kind of hard to predict what he is going to do, honestly, because he hasn’t been to any of the competitions. The sport has changed a lot from when he came back in Vancouver for the Olympics. So for him, it’s going to be very, very challenging to just come back for Sochi. It’s a very different men’s field from what he saw, what he skated with four years ago. So I’m just going to bring my A game and we are all going to bring our A game. I’ll tip my hat off to him if he can achieve his goal to get to Sochi healthy and do all the quads that he used to do. But you know, we’ve all been on the Grand Prix circuit, we’ve had experience, we’ve done many, many programs not only in training but in competition. He has spent a lot of time rehab and injured and so it’s going to be tough for him. But it will be very amazing to see him. He’s always been the talk of the town and it’s a game in Sochi and I know that they want success. I think it will bring even more excitement to the Games if he can make it. That would be great for all of us. Q: Can you describe your team besides Kathy Johnson and David Wilson? Patrick: Jeff (Buttle) did my short program, so Jeff is also a big part of it. Honestly my team is very simple, very clean cut. David and Jeff they are my choreographers and Kathy is my technical coach and artistic coach. I’m so glad that I’m skating well for myself and Kathy as well, because there was for sure a lot of doubts from outside people that thought that I’d need a technical coach. People may even say that it was her fault that I wasn’t skating consistently last year. I was glad that finally I kind of silenced the critics. I’ve always believed in her (Kathy Johnson) and so I’m glad it’s paying off now. Q: You have been to Sochi last year for the Grand Prix Final. What memories do you have of Sochi? Patrick: A lot of construction, that’s what I remember. The rink is amazing. I really, really liked the rink. It’s an Olympic rink. You can feel that there is going to be a lot of energy. It’s really well laid out. I remember that. That’s one of the things that I know when we go there, the gym will be there, equipment will be there, space will be there for us to warm up. The change rooms are perfectly located after the press conference areas. It’s very organized already. The infrastructure is so well designed. That helps just to know where I go. The rink is ready. The hotel we were staying at, the sanatorium, that was an interesting experience, very Soviet style. The palm trees were interesting. It was cold, though. The ocean was beautiful. It was really, really nice. It’s going to be fun. I hear a lot of doubts and negative things about Russia and how people think it shouldn’t be there. I don’t care, I’m happy and I know that Russia will pull it off and build everything on time. It’s going to be a really beautiful place with palm trees and it will be great. Q: What will happen after the Olympic Games to you? Patrick: It’s funny. I hear everyone is announcing their retirement, like this is their last Grand Prix, like Jeremy (Abbott), like Nathalie (Pechalat) and Fabian (Bourzat). This is it! I think, man, that’s heavy to say it so early. I’m still young, there’s still a lot of things that I can do. I’ll probably take next year of. I’m going to try to go to Worlds, Kathy wants me to go to Worlds. But I definitely want to keep skating. Skating will be a part of my life after the Olympics. It’s not like I’m going to school or something. I love performing, I love doing shows, I love being able to able to skate to lyrics. Lyrics will be possible in competition, too, so maybe that would be an incentive to come back. Q: Tell us something that maybe not so many people know about you. Patrick: I absolutely love cars. Cars is my thing. My dream would be to be a race car driver if I could in my life. I go to the autobahn and drive really fast. I like German cars, I have a German car, a BMW.